Latest News: The Ark Addendum - Ravage's Transform and The AllSpark Almanac Addendum! PROWL is dark, sleek, agile, mysterious, and the ninja of the team. He speaks only when he has to, and even then as briefly as possible. Of all the AUTOBOTS, he's the most skilled in direct combat. A natural spy, PROWL can infiltrate most any location unseen and unheard, so he's used for reconnaissance more than any other Autobot. He is a bot of very little talk and much action. He's unflappable, precise and has developed a keen interest in organic life. Robot Mode Power: PROWL is an expert in camouflaging himself. He can turn virtually any object into a weapon. He also has keener senses - higher rez everything - than the other AUTOBOTS. Prowl has spent his life studying the secrets of the acient art of Circuit-Su. Through its teachings, he has discovered the beauty of pure logic, and the invincibility of reason. All things - even combat - are subject to reason. If one is willing to calmly apply one's mental faculties to any problem, the solution will soon reveal itself. He often finds the chaotic antics of humans and other AUTOBOTS frustrating, but he will stop at nothing in their defense. Abilities 1) Master of Circuit-Su. 2) Projects holograms for use as camoflague. 3) Can use any object as a weapon. Silent and stealthy, Prowl prefers to let his actions do the talking. He's a natural spy that can infiltrate any location unseen and unheard. Prowl's jump jets allow him short bursts of flight. "Through stillness you will find truth." PROWL is the silent ninja of the team; he only speaks when he has to and it is as brief as possible. Of all the AUTOBOTS he is the most skilled in direct combat, he is a natural spy and can infiltrate without being detected. PROWL is the AUTOBOT of little talk and a lot of action. ROBOT MODE POWER: "Shuriken" PROWL'S main weapon are his throwing shuriken, bladed weapons that hurl through the air (always returning like a boomerang). He has a myriad of these at the base, and uses them when needed. Some are separated, super charged, others ENERGON based. PROWL also possesses powerful JUMP JETS that allow him short burst of flight. Projects holograms for use as camouflage. Can use any object as a weapon. 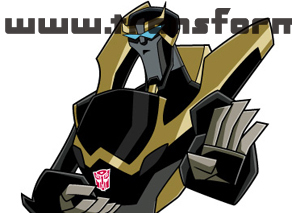 The premier Transformers Animated resource.